I’m back this semester to continue my internship and complete my Rubik’s cube project. I have barely started working on the robot again. The few glitches are almost all fixed and we found a way to make the cube easier to move. The only problem that we are currently facing is the inaccuracy of the color sensor. My goal for this coming month is to design and build a new robot. I’m hoping that this new design will have less problems than the previous one and that it will work more accurately. However, building and testing the tilted twister has helped in giving me an idea of what to expect and inspired the concept of the new robot design. So far, I have been doing mainly research and trying to learn the basics of a new programming language. I will be sure to continue updating this semester. This is our model robot, A.K.A. the Tilted Twister. This week has been a very productive one indeed. We finally have a sample robot built and we ran a premade program on it just to see how the robot works. You can click on the link below to get a glimpse of the robot. Click this link to see the video: Tilted Twister. We’ve decided to program the robot using Robot C which is compatible with the LEGO NXT Brick (the brain of our robot). I’m currently working on writing an algorithm, with the help of the group, that can solve the first part of the Rubik’s Cube. The robot was having some mechanical problems with the color sensor while we were testing it out last week, so I will be sure to take a look at that this week. The robot is also very sensitive to the slightest difference in position of the cube so we will need to take that into consideration. Additionally, the following link is to the website where I found the robot design: www.tiltedtwister.com. Hi, I’m Andrea Rivera, I’m also a summer intern from Harmony Science Academy. I’m also quite excited to be working with UTEP’s Computer Science Department, I must say it’s a pleasure to be working with such intelligent people here. Unfortunately I haven’t been able to find the time to post and update my reports until now, thankfully my schedule is clearing up so time will not be a problem anymore and I will be able to post my reports.Well, my interest is in biomedical engineering so, the project I’ve chosen to do is to design and build a robotic arm to cut into a model of the human body and perform a hepatectomy, which is the surgical removal of the liver, or pancreatectomy. So over the past couple weeks I’ve come up with a prototype design for a robotic arm and simplified it to have 6 degrees of freedom (DOF) as too many DOF’s would be very difficult to code for, at this point simplicity is key. I’ve also chosen a scenario and have started building the arm as well as began learning RobotC which is the language I plan to program the robot in. So far the project has gone alright, however I’ve been having a bit of trouble learning RobotC but that’s nothing an extra hour of practice can’t help. The real question now is if my design needs to be changed further. The Rubik’s Cube project is going really good. We finally figured out how to solve the cube ourselves with the help of a few tutorials. Solving the cube itself is pretty tricky. Although there are algorithms that aid you in solving the cube, you can never be sure that your individual cubes are going into the right position on the faces of the cube. However, a human can determine whether those cubes are on the right faces by reasoning with the colors. The robot, on the other hand would be following an algorithm which would limit its ability to be able to recognize these errors and continue its program. So our problem now is, how can we write an algorithm that would give the robot the ability to recognize and reason with the different problems on the cube? I’m Roya Edalatpour, the new summer intern for the CR2G Research Group from Harmony Science Academy. I am really excited to be working with such wonderful and brilliant people in the UTEP Computer Science Department. 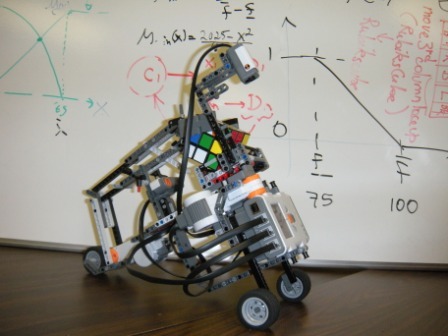 For my research project, I have chosen to build a robot that can solve the Rubik’s Cube. With the help of Dr. Ceberio and her students, we are hoping to be able to achieve this. This week, we focused on the design of the robot and what type of physical constraints the robot would have. Basically, our strategy is to build a robot, test different algorithms, and eventually build up and improve on the design over time and experience. 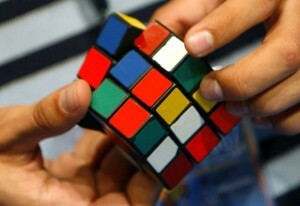 But for now, I’ve been working on finding a solution to the Rubik’s Cube so that I can solve it as well. Here, you can find the progress report of Andrea and Roya who have joined CR2G for summer 2010. Summer 2010: CR2G is in charge of coordinating projects offered to high schools students of El Paso who are part of the Early College High School program with EPCC. Dr. Ceberio is coordinating the effort while Luis Gutierrez and Luis Martinez (two active members of CR2G) are instructors for the two students who chose our project this summer. Current information about the progress of the project can be found on the facebook page of the project. prime numbers in scratch and their applications.